A weekly newspaper splashed about the discovery of a headless monkey in the town…before it emerged that the animal was in fact a squirrel. 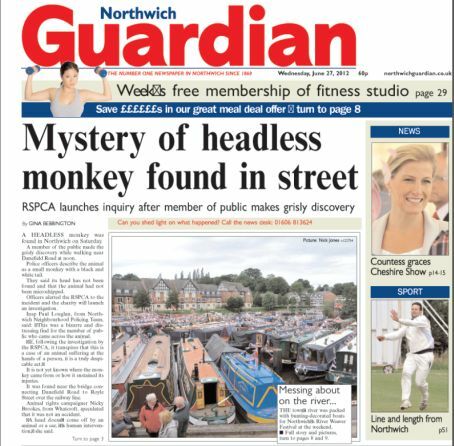 The Northwich Guardian’s front page this week was headlined “Mystery of headless monkey found in street” told how a member of the public had found the animal on Saturday near a railway line. Police described it as a small monkey with a black and white tail and alerted the RSPCA to investigate the incident. 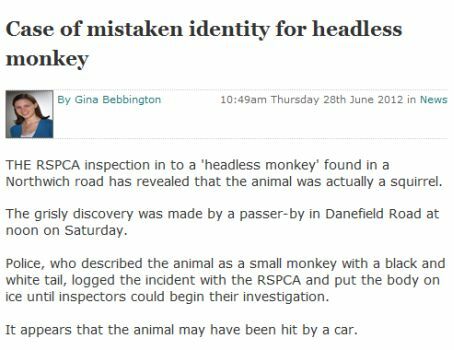 However, the paper has now published a story online saying the RPSCA investigation had revealed the “monkey” was actually a squirrel under the headline “Case of mistaken identity for headless monkey”. The follow-up article says: “The RSPCA inspection into a ‘headless monkey’ found in a Northwich road has revealed that the animal was actually a squirrel. “The grisly discovery was made by a passer-by in Danefield Road at noon on Saturday. “Police, who described the animal as a small monkey with a black and white tail, logged the incident with the RSPCA and put the body on ice until inspectors could begin their investigation. Pity it wasn’t in Hartlepool ! Presumably it’s not a JP publication… or it would have been headless chickens! Stop monkeying around….everyone knows it was an alien sent here to bring enlightenment. Got the chop for trying to reveal David Cameron is a shape-shifting lizard whose underpants are too tight. Government cover up. This comes under Ignorant Public (No Time to Check it Out Division). It’s similar to my local paper getting terribly, terribly excited after someone reported seeing a Great Spotted Woodpecker (relatively common, and a pest at nesting time) in their garden. The newsdesk even asked readers to send it sightings. Come on, newsdesks, don’t forget the pinch of salt rule – if it’s unlikely, then it probably isn’t true unless you can really verify it! Harsh that, the police said it was a monkey, no? Their fault! and the lesson is . . . never trust a word the police say. And that tells the reader what?